One of the coolest things about a virtual community like Second Life is that creators really put a lot of effort into the items they make (well the ones that are legit and don’t take from other hard working people but that’s an entirely different story). Many skin makers tend to pay homage in ways to some of their favorite celebrities or pop culture icons when making face skins. The proof of that can be seen in Birth’s latest male offering that is a Skin Fair exclusive named “Mr. Lee”. I likely don’t have to tell you who this skin is patterned after but just in case I can at least give you a hint: He is a legendary martial artist who passed away way before his prime and his son Brandon (who is in one of my favorite movies of all time) did as well in 1993 during filming of that movie. The level of detail in this skin is remarkable as is the quality of the body applier. I would say that personally I would wear more Birth skins (as I also love their facial hairs) but their range of skin tones doesn’t cover what I feel represents me. Their skins are awesome but as an every day wear it just isn’t in the range that I’m used to, however, it is for a lot of people as I know most skin creators work when I see people out on the grid I know who created their face. Yes that sounded a lot less weird in my mind but I hope it makes sense. This release has 7 different tones which I am also providing a skin key for so that you can see what is offered. Also keep in mind that this is a Catwa applier which I am wearing on the “Daniel” head. Each tone applier has options for eyebrows, hairbase and beard combinations with different hair tones for all three. The body appliers which are sold separately also have options for bare skin or two different options of body hair also with the same tone colors for body hair. Also from Skin Fair is the very discreet “Infinity Tattoo” from Reviver. This is a store that is new to me so I am just learning about it as I go but I chose to wear this ink because I enjoy the message it has to it which is essentially “love forever” in the form of an infinity symbol with a feather and the word “love” on the top and bottom. Such a great message really and it doesn’t have to even mean love for your significant other, it can be love for your parents or family or even for yourself because it all starts there. While it may be cliche to say…love truly starts with yourself and if you can’t love you then there’s no way that you can love anyone else. With a face that looks like one of the most legendary martial artists of all time it would be ridiculous not to have hand wraps (taped hands). The “Luctator” hand wraps by L’Emporio & PL are just the thing that anyone who wants to take a photograph depicting hand to hand combat or fighting of any kind to make it more realistic. The tape is so realistic looking that you know L’Emporio took great care in making these. Truth be told I had been looking for something like this for a while but had given up looking. Seems it was the right timing and just fell into my lap. The coolest part to me is that each version comes with 3 colors (white, dirty, and black) each with clean and bloody types so that you could take a photo before a skirmish and then take another one that would take place after with the blood stained texture. These are the kind of things that make me happy in the virtual world when it comes to accessories or clothing. It just takes the right person with a similar mind and the expertise to be able to create it and bring it to consumers like myself. Now that I’ve had my fun trying my hand at being a peaceful warrior, maybe I’ll wear the hand wraps again and do a follow up photo where I’ve hit the streets of some location and take down some evil doers with my fists of rage. Come to think of it many video game characters have also had their fists wrapped over the years so that could be put to use for an idea as well. On that note I’m going to tuck this blog post in as it is also getting late where I am at and there’s plenty of things to do tomorrow. It’s looking to be a full day so my next blog entry may not be again until Wednesday with how things look. I hope that something in this blog has inspired even just one reader to take a glance at both of the events I’ve covered in this post even if not for the items I have featured. Be well until our paths cross again grasshoppers! My apologies to those that might check the site for new content but this last week has been a bit hectic for me but it’s not for bad reasons at all. Usually I am not much for talking about things outside of my photos or certain themes but this is worth talking about in my mind. Our family has been looking to expand and that can often be scary in some instances but in mine and Brenna’s case it’s been pretty awesome. Alyx (who we also call Elijah) has been a part of our lives for about a week now and sometimes I find it hard to connect with people but this young man is nearly a mirror of me in the fact that we both enjoy graphic work, movies and a whole bunch of other pop culture stuff that makes this seem much like fate (which not everyone believes in). I am not gonna get too much into things right now but I’m enjoying getting to spend time with and even get creative with him. So what do two nerds that are creative do when they have a little free time? Well they get together and set up a photograph and I get to share my blog process with someone that is interested in it…definitely a win/win in my book. Alyx introduced me to a new location called Midnight Glory which I would say is a photography sim with a lot of different mechanics to it to allow photo takers and bloggers to roam around and find an interesting spot within the design and being new to it, I told him to find a spot he really liked and it just happened that he has a good eye and it worked to my advantage. The area he found (a garage full of nerd stuff) prompted me to come up with the soundtrack to the post right away. “In The Garage” has been a jam (I almost could say an anthem) for me for over 20 years and has lots of nerdy and geeky elements in both the verses and chorus. Making references to X-Men comic book characters to even members of the band kiss…but what really hit home is the opening verse talking about a “Dungeon Master’s Guide” which is what Dungeons and Dragons players have used for decades to tell stories of wizards, warriors, and mythic creatures. I was one of those who at the time when it wasn’t such the in thing to do got together with my friends on weekends (and once in a great while on a school night) and we’d have a blast rolling dice and trying to get through a story. Continuing on with the theme of nerd power, my hair style is an homage to one of the best survival horror games of all time, “Resident Evil 2” which was re-released not long ago as an updated version which current generation graphics. 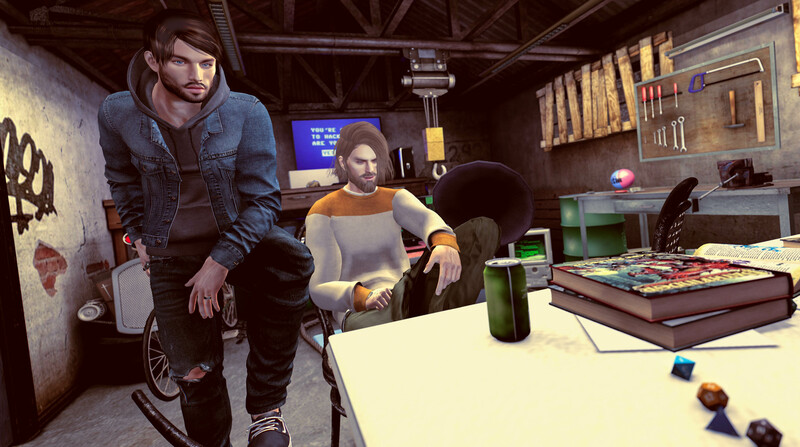 Modulus released the “Leon Hair” at the beginning of the month at the FaMESHed event to commemorate and immortalize it in our virtual leg of the world. I really like how the hair is parted and sweeps over the eyes without directly falling over them; I also have to say that it really excited me to see this because it was definitely a game I spent a lot of time on back when it was first released. Leon S. Kennedy was a character I grew very fond of and thought of as being a hero and relatable. After putting my look together (I didn’t take the photo for this blog right away so I’ve been wearing it for a bit), I was told that I was wearing a Canadian Tuxedo (again). This is not something I consider an issue as virtually I consider myself equals parts Irish and equals part Canadian so wearing this type of attire is my birthright right? Cold-Ash’s newest release the “FLYNN Denim Jacket” is a major reason why I would suggest a shopping trip to The Men’s Department. I didn’t realize how much this jacket fit in with my overall theme until probably just now because these kind of jackets while still fashionable now were a big thing back in the 90’s which my mindset has been in during this entire blog process. One of the features I like best about this jacket is that you do have the option to wear it with a built-in hooded sweatshirt or with a regular shirt; to me that makes it worth it just in that respect. Outside of the FATPACK, the event has 6 denim versions to purchase but if you want the best deal and all the options to change the color of the hoodie or shirt you are wearing with it, getting the whole shebang as they say is well worth it. Alyx is wearing the latest hair from lock&tuft called “no joke” that is currently available at Shiny Shabby; Alyx is the creator and own of the brand as well. It’s not often that I have conversations with anyone that in turn inspire products that are brought to life within very little time as this hair has. We got to talking about hair styles and I had thrown out the idea for this style and he was willing to give it a shot; it is now at one of the big monthly shopping events for everyone to enjoy. I will also be wearing this hair myself in an upcoming post but the idea will take some time to put together but I promise that it will be quite a bit of fun. On that note I feel like there are a lot of credits that have gone into this blog and getting through them to make sure that I’ve crossed my t’s and dottied my i’s is definitely going to take a moment which makes it that time to get this blog ready to post and start getting ready for the next one as I have been rather lethargic this week when it’s come to posting; the month is short enough as it is and I’ve still got some important things I want to share. I want to say a big thank you to Alyx for joining me on this ride and we had a very good time. This was definitely the beginning of quite a few collaborations in the future if this is any indication because I enjoy working with others when ideas come to mind and with those I have worked with it has been nothing but great times and memories. So long for now and enjoy the rest of the weekend! Not many television shows have had the longevity that Supernatural has had for the last 14 years. It is one of my favorite shows and that fact they can still keep my attention this long tells me that they are doing something right. I’ve started some shows in the past that I never ended up finishing (The Vampire Diaries which I was gladly able to pick back up on Netflix). The adventures that the brothers Winchester go on are very exciting no matter what they or their acquintances (friends and family as well) get into. I have done several posts displaying my fandom for the show from the perspectives of Sam & Dean as well as done on where I had a friend play Castiel. However, not once did I ever think about doing something that pays homage to one of the many antagonists on the show: the demons. During my post processing I had an issue where the black smoke I wanted coming out of the meat suit (the vessel the demon is hiding out in as referenced by the show). It was too dark so I decided to go with red, which man of the higher ups in the demon world have when “smoking out” of a vessel. Notably Crowley and I believe Lucifer himself have displayed the crimson version to my knowledge. There have probably been others but having been on the air for 14 seasons (and rewatching them from the beginning would take forever) it is easy to forget things. Pose Fair ends tonight and I am hoping this is the equivalent of going out with a bang. I’ve enjoyed this tremendously and am likely going to take a day or so break from posting to recharge (maybe) before I start to see things from the February special edition for Valentine’s goes into effect. I would like to thank Ruby and Jason (as well as everyone else behind the scenes) for creating such an awesome environment to blog for. It is an honor to have been chosen by you for this event and I cannot express how much it means to me. Getting down to it my last pose is from CORPUS Poses and is easily enough called “Him”. It is a varied set of standing and a sitting pose and one of them happened to be one where I am looking up which was perfect to get in just the right angle where I could simulate a demon vacating my avatar with a little bit of help from the LeLutka face hud (the facial expressions are not a part of the pose just to let you know). There are five poses to this set in all and they are all really usable in just about any situation you can think of. To take a catchphrase from another show “TREAT YOSELF” and stop by the Pose Fair one more time or for the first time before it ends tonight. Your photography will thank you for it and that is something I can genuinely guarantee. For this blogs style, I decided on casual while combining and older release with a brand new one. My shirt comes from Deadwool and is called “Lorenzo”; it is a tucked in button down with shirt underneath. It’s one of those pieces of clothing I like to revisit and it just happens to pair up well with the “Roll Up Pants” by Native Urban which just hit the racks at Uber a few days ago. Gentleman if you like dress up style pants with a bit of a roll up cuff at the bottom then these are definitely your new jam. While single color options can be nice I can only stress how much of a value it is to get the complete FATPACK and give yourself many options to allow for pairing it with about any of the shirts in your virtual closets. To be able to change parts of it such as the belt, the pants and even the slight little bit of boxer shorts poking out I can’t find a better reason not to go all in. On that note I think it is time to finish this up with giving you all the style information that pertains to this look and of course if there is something here that you see that you are interested in that is not listed then first check my Credits page which lists what head, skin, and body that I am presently wearing on a consistent basis. If it is anything else then get a hold of me through social media or by email which is on my about page. Time to go celebrate all the creativity I’ve had with the Pose Fair and maybe relax with some games and time with great people. I will catch everyone again hopefully very soon but until then be well and start a conversation and keep it going. My coverage for Pose Fair is close to completion as the event closes up tomorrow night but I still have a few more tricks up my sleeve before all is said and done. I grabbed my brother Paul for a shoot that reminds me a little bit of when I was younger in the real world and I used to spend time with my brother. Memories like this are fun to try to portray virtually because the internet is able to hold onto them for a long time. Space Cadet’s pose set “Teen Spirit” is a fun one that has five different air guitar poses. Not many people I know of do it today but it was a pretty big thing to do for fun when listening to music in my younger years (This was before video games took over). Both Paul and I have different poses from the set and I cannot tell you how much fun we had with this and the coolest part is that the poses are named after musicians such as Axl Rose and Slash from Guns N’ Roses. Many of the poses that I have used for blogs from Pose Fair are great (as are ones that I have not as well) but this definitely is a lot of fun and I think that anyone that gets this pose pack could live out their rock star fantasies. Modulus has quite a few new releases going right now and in this post the style I have on is the “Pete Hair”. It is a short to mid length style that flows to one side of the face or the other depending on which version you wear. I have seen a lot of musicians have similar hairstyles to this and using it for this photo works out for me because I feel like I choose the right direction for the hair to fall as I jam out to some Boston. It goes without saying that if you’re a guy looking for new hair that you should check out Modulus not only just their store but also at the events they participate in which they are attached to some of the best out there including male specific ones. I‘ve been sticking with my closet and wearing clothes that likely have been featured a time or two here but I decided to do a little shopping this afternoon; visiting both The Men’s Department and Men Only Monthly to put together an outfit that I really like. I’ll start with my shirt which is from Chuck Size and called “FABIO”. Graphic shirts are probably my most favorite type of shirt there is and the designs that this store has on theirs is super cool to me. It only makes sense that if I am doing a photo where I’m playing air guitar to possibly one of the most well known songs of the last 40+ years that a shirt with a skeleton holding a guitar is appropriate. The jogging pants I am wearing come from etham and can be found at Men Only Monthly. Taking into account all of the previous things I mentioned, jogging pants made it clear to me that I have kind of a retro look going on that is pretty 80’s or 90’s inspired. Might as well be comfortable while I’m doing my best impression of just about any famous guitar player out there wailing away at a guitar solo. Paul is attired in past releases from Cold-Ash and takes after his brother when it comes to knowing good clothing when he sees it. On that note I think we’ve jammed out a good while and you all know what’s what. Time for some credits to get you out there shopping and if the weather is anything like it is here…staying in and going on a shopping trip is a lot more exciting. If you must venture out please be safe and warm and do NOT lick frozen light poles, you’ll live to regret it!